Rob Jones does have the scope to bring in loan signings as part of his caretaker manager role at Rovers. But he insists he is happy with the current make up of his squad. Paul Dickov had lined up the loan signing of a right back which was expected to go through last week until his sacking on Tuesday. But Jones says he does not currently have anything planned in the loan market. “If I see fit and the right player comes along, I’ll make a claim to make a signing,” Jones said. “But I’ve got enough in my dressing room. “I’m delighted with the characters I’ve got in there, I’m delighted with the work rate they give, I’m delighted with the ethic and dynamic of the group. On being handed the reins on a temporary basis, Jones welcomed Richie Wellens back into the first team fold. Wellens looked to be on his way out of Rovers due to a desire to move to a club closer to his Lancashire home. But a move – understood to be to Wigan – failed to materialise. After returning to training last week, he was an unused substitute at Walsall on Saturday. And Jones was full of praise for Wellens and his attitude since being welcomed back. He said: “Richie Wellens was terrific Thursday and Friday in training. “That was one of the main reasons why he was back involved with the squad. 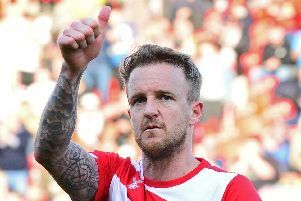 “I told him on Thursday morning when I took over that he needs to show to me and his teammates that he is here for Doncaster Rovers, he’s here to be a positive influence on the team and the squad. “He’s done that over this week. He’s been top class. His work rate, he’s been positive, he’s helped the younger ones, he’s been a bright spark around the club.